Diego Valley Charter School, Lakeside Campus — Project Cornerstone, Inc.
On February 9, 2016, Project Cornerstone visited Diego Valley Charter School Lakeside campus. The class of fourteen high school students learned about the importance of local construction aggregates in their every day lives. Students tested two types of sand (i.e., river and beach) to see which is best for making concrete, by performing a sieve (gradation) analysis. Each student determined if their hypothesis was correct and graphed their results. Students were also given a word problem where they had to figure out the cost of sand and transportation if one sand source was located 25 miles away and another 90 miles away. They were shocked to see the drastic difference in cost based on the source's location. At the end of the class, students mixed their own small batches of concrete using sand, gravel, recycled aggregate, cement, and water. They poured their concrete mixtures into various molds. 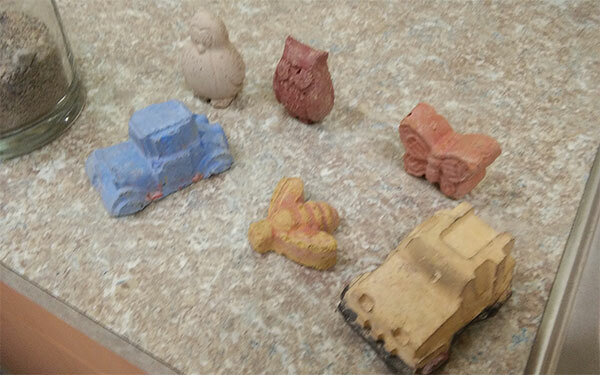 Once the concrete was hard enough, they were able to take them home.